This easy Tuscan white bean salad with shrimp and lentils packs great nutrition and bright flavor. Crunchy veggies, fresh mint, capers and a light dressing make it anything but boring. Serve it with your favorite whole wheat crusty bread or crostini. 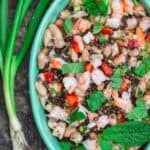 In a large mixing bowl, place the white beans, lentils, majority of the cooked shrimp (keep a few chunks of shrimp to add on top later), green onions, bell peppers, minced garlic, capers and fresh mint. Season with salt, black pepper, paprika, and cumin. Dress with EVOO and white wine vinegar. Give everything a good toss to combine. Transfer to one large serving platter and top with the reserved shrimp. Or divide salad among serving plates. Serve with your favorite crusty whole wheat bread or crostini. Cook’s Tip. This salad taste better if you let it sit for about 30 minutes or so to allow the flavors time to meld. Better served at room temperature. Cook’s Tip. This bean salad will serve 4 for lunch or a light meal. If you’re serving as a side salad or as an appetizer alongside other mezze, it will serve more. Prepare Ahead Tip. When preparing this salad the evening before, I prefer to keep the shrimp out but mix the rest of the ingredients together. Refrigerate in a tight-lid glass container (refrigerate cooked shrimp separately.) Mix the shrimp in a few minutes before serving. Cook’s Tip for using Dry Beans and Lentils. If you prefer to cook your beans and lentils from scratch rather than using canned as in the recipe, here is how: How to cook beans. Beans will require soaking overnight (about 8 hours) in plenty of water. Rinse them well after soaking. Whatever amount of beans you start with, you’ll need 2 times the amount of water to cook them. For this bean salad recipe, you can start with 1/2 cup (100 g) of beans and add 1 cup (250 ml) of water. Simmer on low for about 45 minutes to 1 hour until beans are tender. Drain and let cool. How to cook lentils. This salad works with black lentils, brown lentils or French green lentils. If you are cooking lentils from scratch, you can start with about 1/2 cup dry lentils for this recipe. Rinse lentils well and combine with 1 1/4 cup of water. Simmer for 20 minutes or so until tender. Drain and let cool. Recommended for this Recipe: Early Harvest Greek extra virgin olive oil (from organically grown and processed Koroneiki olives). And from our all-natural spice collection: sweet paprika and ground cumin. SAVE! Try our Greek EVOO Bundle. Create your own 6-pack from our Mediterranean spice collection, or try our Ultimate Mediterranean Spice Bundle.